If you aren't keeping up with the latest internet trends, HTML5 video is helping to essentially take the internet to the next level with it's revolutionary video coding format that those that have created it are hoping to bring into the mainstream for use. The most exciting part about HTML5 is that you don't have to use plugins in order to see it. There are of course pros and cons to this but the biggest benefit is it's more universal ease of use. Now that you have a good idea of what HTML5 video is, you can learn what kind of browsers and formats already support the HTML5 poster attribute, the benefits of it, and how to take advantage of this exciting new upgrade to the internet! When it comes to browsers, you can expect all the mainstream browsers to be essentially part of the movement including that of Google Chrome 4.0, Internet Explorer 9.0, Mozilla Firefox 3.6, Safari 4.0, and Opera 10.5! This means that if you're using these particular versions, you have already had the pleasure of experiencing that of the HTML5 video poster attribute and the exciting benefit and convenience it holds! The formats that already support the video element are that of MP4, WebM, and Ogg and of course compatibility and availability will be subject to be based dependent on the version of your browser as well as the video and audio codecs. The kind of benefits you should come to expect from HTML5 video is ease of use when it comes to coding which makes it much easier for web developers and designers out there. With a simple one-line piece of code, you can assign the ideal image you would like to use, and with just a few additional lines of code, you can fully utilize the poster attribute for all your videos easily! 1.Drag-n-drop whatever video you want to convert. 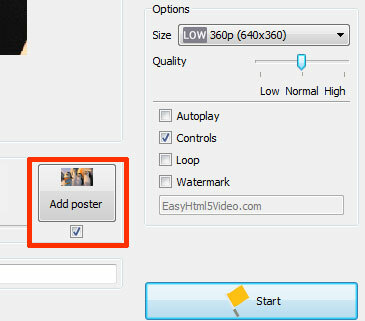 2.Set the poster image you want to display while the video is downloading, buffering or otherwise for the user as well as the codecs that best match your format, and then tune your video! 3.The last step is simple, just press the “Start” button and you're all set to have everything all done for you providing all the necessary code, images, and videos for your HTML page. What're you waiting for? Check it out today and save yourself some time and effort with this efficient tool from EasyHTML5Video! For troubleshooting, feature requests and general help contact us at . Make sure to include details on your browser, operating system, Easy Html5 Video version, link to your page. In most cases you'll get a reply within 1 business day. © 2019 Easy HTML5 Video --- All Rights Reserved.